Sure every student pilot and FBO should have this poster. It is way cool and very detailed. Be sure to click the image so you can see more detail on this great flight poster. 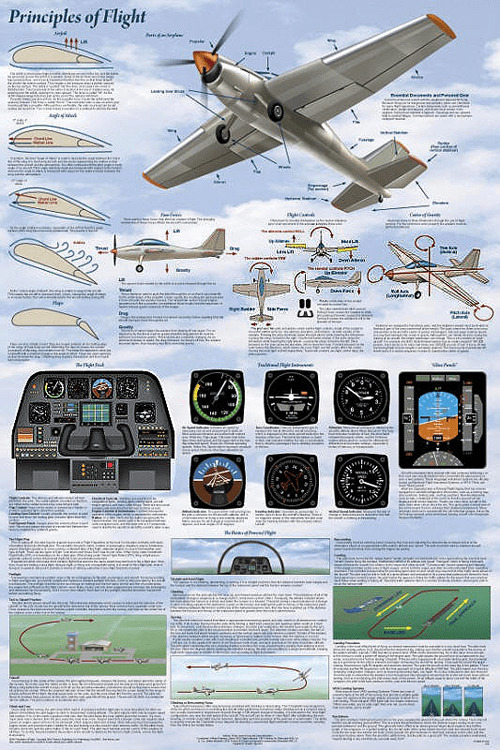 Aviation Poster – The Basics of Flight Aviation Poster is a great pilot gift for the want to be pilot, student pilot or real pilot. 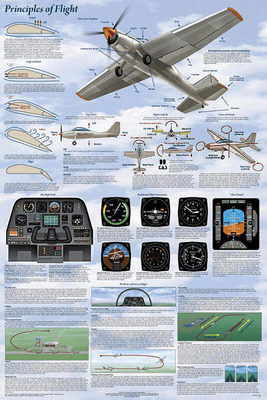 This aviation poster covers the basics of flight such as the four forces of flight, wing airflow, cockpit instruments, airplane controls and much more. Our laminated Basics of Flight Poster has the same high quality standards that are used to produce expensive art prints. The poster paper is heavy and hard in order to preserve tiny details, and provide a crisp detailed look for the images. Poster size is about 24" by 36" and the poster arrives rolled in a plastic sleeve. Every FBO and flight school needs one of these posters. Bought this for my husband for Christmas and he loved it! It turned out great! Excellent quality - bright, vivid colors, great information, laminated! Was shipped very securely. I purchased 2. One as a gift for my son, who is a 15 year old student pilot, and another for a gift exchange among young aviation enthusiasts. The cost of the gift exchange needed to be kept under $15 and this was the best value for the price! Highly recommend.